GraceConnect » Congratulations, Dr. White! Terry White, publisher of BMH Books and former executive director of the Brethren Missionary Herald Company, Winona Lake, Ind., was awarded an Ed.D. 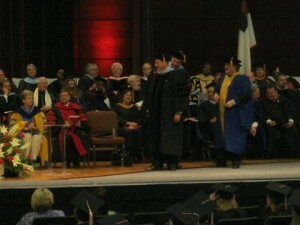 degree in Organizational Leadership on August 11. His dissertation was “An Analysis of the Relationship of Transformational Pastoral Leadership to the Seven Practices of Transformational Churches Among Grace Brethren Congregations.” He surveyed pastors and congregations of 18 Grace Brethren churches to see whether there was a relationship between pastors whose leadership style is transformational, and congregations who exhibit the seven practices of Transformational Churches. The theoretical base for the study was transformational leadership theory, as developed originally by James MacGregor Burns, Bernard Bass, and Ronald Riggio. Pastoral leadership style was determined through administration of the Multifactor Leadership Questionnaire short form (MLQ5X) and the level of transformational practices in the congregations was determined through administration of the Transformational Church Assessment Tool (TCAT). Statistical procedures were used to test the null and research hypotheses for statistical significance. The findings did not indicate a significant statistical relationship between pastors whose leadership style was primarily transformational, as measured by the MLQ (5X) and congregations who were transformational in character, as measured by the TCAT. Terry continues to work part time at BMH, where he oversees editing and publishing of book projects. He is also the founder and primary contributor of this blog. He and his wife, Sharon, are members of the Winona Lake, Ind., Grace Brethren Church (Bruce Barlow, lead pastor), where he is currently the Moderator and serves on the Board of Overseers. Dear Terry, Congratulations on getting this doctoral degree on a very important and difficult subject. We appreciate so much your ministry at BMH and providing us with good Christian literature as well as keeping us informed with update news in our Grace Brethren Churches. Congratulations, Terry Your doctoral degree is quite an accomplishment! May God continue to use you as you serve Him faithfully. Congratulations, Terry! 'Sorry I missed the big event. Sherlene's family had their annual family reunion in Hershey. I enjoy being married, so the reunion took priority! God bless you in your ongoing noble work for Christ! Considering the immense contribution he has made in the field, Terry White truly deserved this award.